Several factors, including stress, medication, menopause and medical conditions like polycystic ovarian syndrome can your body's estrogen levels. While no over-the-counter supplements contain true estrogen, several medicinal herbs include compounds that mimic estrogen or act to increase estrogen levels. Phytoestrogens-- plant-based compounds structurally similar to human estrogen-- have been investigated as possible treatments for menopause symptoms and infertility. Herbs like chaste tree berry can enable you body to achieve an ideal balance of estrogen and progesterone. Extracts of the soybean are potent sources of isoflavones, a specific type of phytoestrogen commonly used in the treatment of menopause. According to the National Center for Complementary and Alternative Medicine, some women experience fewer menopause-related hot flashes while taking soy isoflavones, while others experience worsened symptoms. Soy's effects may vary based on each person's individual endocrine system. The flowers of the red clover plant contain isoflavones and have a reputation for relieving hot flashes and respiratory distress. 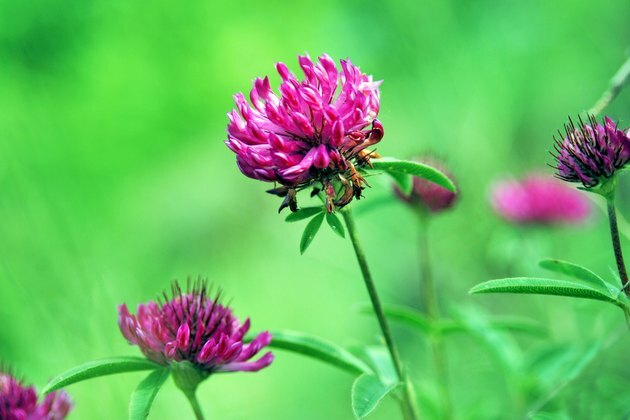 Several studies have investigated red clover's impact on hormone-sensitive conditions like menopause, premenstrual syndrome, breast pain and infertility. Red clover's actions are subtle; it does not have a powerful impact on estrogen levels or any other hormone. However, because it is well tolerated and associated with very few side effects, it remains a popular choice among people hoping to elevate their estrogen levels. Another popular menopause remedy, black cohosh contains a natural estrogen-like compound known as fragrine. Black cohosh helps to increase blood flow to the pelvis and uterus and has been historically used as a treatment for menstrual disorders related to low estrogen levels. Recent studies have cast doubt upon black cohosh's traditional use as a menopause treatment. While chaste tree berry does not contain estrogen or phytoestrogens, it may help to enable hormone balance in women of all ages. National Center for Complementary and Alternative Medicine cites several small-scale studies suggesting that this herb, also known as monk's pepper, can reduce breast pain, infertility, low libido and premenstrual syndrome. In theory, chaste tree berry works by improving the balance of progesterone and estrogen within the body. Chaste tree berry is a particularly common supplement for women suffering from hormone imbalances.